Playing poker professionally: Can you make a living playing online poker? This content is not intended for an audience under 18 years of age. Can you play online poker professionally? In life we are always told to chase our dreams, and for many people the idea of playing online poker ‘professionally’ is both a pipe dream and something they actively seek. It’s not easy of course, but if life is a game of risk-and-reward then handing in your resignation and striking out as a card shark is the ultimate calculated risk. So, can you make a living playing online poker? The answer is a resounding yes…but you will need to follow a few basic rules—and avoid the most common pitfalls—in order to make your hobby pay. From Texas Hold ‘em and Omaha to Seven-Card Stud and Five-Card Draw, there is a whole bunch of poker variants available. 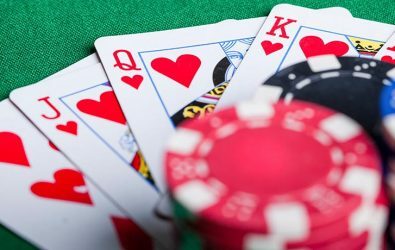 Factor in variations like Fixed Limit or No Limit, cash games or tournaments, and it’s fair to say that there is a stack of ways in which you can enjoy the game. Take the time to try them all…but once you have found your favourite variation, make sure you stick with it and work on improving your game. Playing online at a busy casino offers numerous advantages compared to visiting your local games house. Take your time to explore the lobby, as this will give you a great insight into where the best win percentages exist. Which tables are highly volatile, e.g. players calling and raising more often than usual? These are typically easier to make money on than other types of poker, where conservatism rules and it becomes harder to eke cash out of your opponents. Multi-tabling is an age-old strategy for maximising profit. This minimises risk while enhancing your potential for taking down a big prize; the more tournaments you play, the more chance you have of sneaking into the money places. The key to this multi-table approach is to spend plenty of time at each studying your fellow players. All personalities are different, and identifying those who are liable to emotion-led decisions after a bad beat are your cash cows. The temptation when joining a new online casino is to make a hefty deposit and then load this into a high stakes buy-in game in the hope of winning big money straight off the bat. If you want to make a living from online poker, then you have to treat your play almost like a business. Each time you buy-in to a table or cash game, you are making an investment. So pick out games where you believe you can maximise your ROI. If that means kicking around in some low buy-in events for the time being, so be it. Linked to the above is the notion that there really is no substitute for experience. There’s that old saying that ‘if at first you don’t succeed, try and try again,’ and in poker that is certainly true. Sometimes, you learn more from defeat than you do in victory, so don’t be too disheartened if you suffer an early wipeout in tournament play. Keep a diary for each event you enter and make notes on how you played, what you did well, what not so well, and always have improvement on your mind. The nature of online poker allows you to be lazy and complacent. At home you are likely to have a myriad of potential distractions—family members/housemates coming and going, TV, trips to the fridge, things going on in the street etc. This can breed a lack of focus and discipline; an absolute no-no for anyone wishing to make a living from the game. So the sacrifice is a simple one: if you wish to make profits, turn off the television, put your phone in a draw and draw the curtains…concentration is as much a core skill for a poker player as intuition and resilience. Tracking statistics is one way in which online poker pros gain an edge on their opponents. There is software out there, such as PokerTracker, that enables players to monitor how they are playing and also those around them. Are you sharing a table with a master bluffer or a pragmatist? How will they respond to certain flops? Knowing this information is key to your decision-making….and could be the difference between success and failure. Poker is a game that can test your emotional capacity to the limit: courage, patience, the ability to let a bad beat go…you will find yourself put through the ringer each and every game. Going on ‘tilt’ (which means playing angry) is a sure-fire way to bring your position at the table to a premature end, and if you want to carve a long-term career as an online poker pro then clearly rational decision-making is essential. To return to our original question….yes, it is possible to make a living playing online poker. That’s not to say it’s easy, and there will be days when you question your decision to jack in your job and seek fame and fortune (mostly fortune) on the poker circuit. But if you are willing to sacrifice some of life’s so-called essentials whilst you are building your bankroll, and can put into practise some of the tips we have outlined in this article, then the possibilities for you are almost endless. Can you count cards in online blackjack? Are you looking for more tips, tricks and betting information? Search our site for more great resources to get you started!